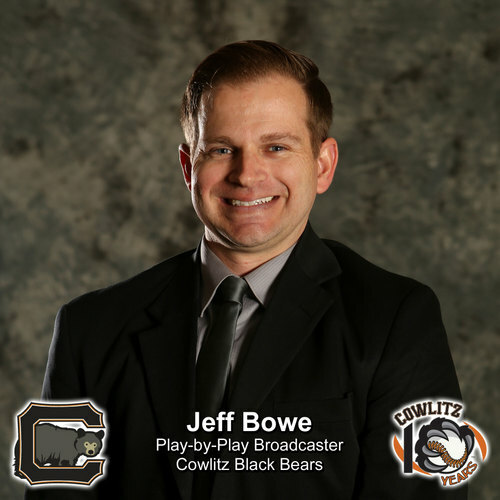 The Cowlitz Black Bears are happy to announce the return of play-by-play broadcaster Jeff Bowe in 2019. Bowe’s memorable game coverage in 2015 makes him the ideal candidate to be an integral part of the tenth Black Bears season. Since performing in the Cowlitz Black Bears broadcaster role, Bowe worked for the Class-A Advanced Jupiter Hammerheads, an affiliate of the Miami Marlins. He then worked for the Miami Marlins in their communications office during the 2016 and 2017 baseball seasons. This included a role during the World Baseball Classic and 2017 MLB All-Star Game played in Miami. In 2018, Bowe performed as Media Relations Coordinator with the back-to-back International League Champion Durham Bulls (Triple-A Tampa Bay Rays). General Manager Jim Appleby says Cowlitz is extremely fortunate to have Bowe return. “Jeff is one of the hardest-working and well-prepared broadcasters that you could ever ask for. His resume is very deep, with some very respectful stops along the way." Bowe returns with a new sense of what summer ball is all about and a new perspective on what purpose the broadcasting role serves during the games and in the community. "I am ready to bring new excitement, energy, and coverage back to the Cowlitz Black Bears in the West Coast League. My goal is to tell the stories of athletes and what they bring to the team this summer. To be a small part of the tenth anniversary of Black Bears baseball will make it a special summer in the northwest."